Arkansas may be overlooked when it comes to vacation destinations, however, the southern state has plenty of unique sights and stays. You can bed down at a dude ranch, a riverside teepee, or a treehouse in the Ozarks. These Arkansas hotels, lodges, and cabins offer something unique that a Hilton or Motel 6 won't. A treehouse may sound like roughing it, but Arkansas offers some unique, luxury treehouses, especially in the Ozarks. These cottage hotels are complete with rope bridges and beautiful views. There are quite a few treehouse operations in Arkansas, but the ones in Eureka Springs are great: The Grand Treehouse Resort, Treehouse Cottages, and Oak Crest Cottages and Treehouses. Perhaps you'd like to stay a little bit closer to the ground. In Parthenon (in northwest Arkansas, near Jasper), you can stay in a cave. The lodge has natural living cave walls and ceilings. Unlike other man-made cave hotels, this is a real, living cave. The lodge boasts modern luxury with satellite TV, a modern kitchen, five bedrooms including a honeymoon suite and a game room. Longbow Resort, in Prim (between Mountain View and Heber Springs), offers four different cabins that are all built to take full advantage of their natural surroundings. One of the favorites is the Bushmaster cabin, which is built on a boulder over a stream. Longbow cabin is built into a boulder facing a waterfall, and it's also quite neat. Turpentine Creek is a big cat sanctuary in Eureka Springs that gives shelter to abused and abandoned big cats (and some other animals.) They have nice safari lodges for adults and a fun treehouse for families. Some rooms have views of the cats, but you can hear them in any of the lodges. If you're visiting Murfreesboro for the diamond mine, you might consider staying in a teepee. Diamond John's has four teepees along the Little Missouri River. The teepees accommodate up to four people and actually have queen-sized beds, so it's not exactly roughing it. Diamond John's also has cabins if that's more your style. Some of the dude ranches in Arkansas are more like a bed and breakfast, and others involve you in the day-to-day workings of the ranch. Horseshoe Canyon Ranch in Jasper offers lots of fun activities and excursions for the whole family. Stone Creek Ranch in Mountain Home has horses and offers lessons and cattle drives. Bar-J Ranch in El Dorado offers horseback riding, too. 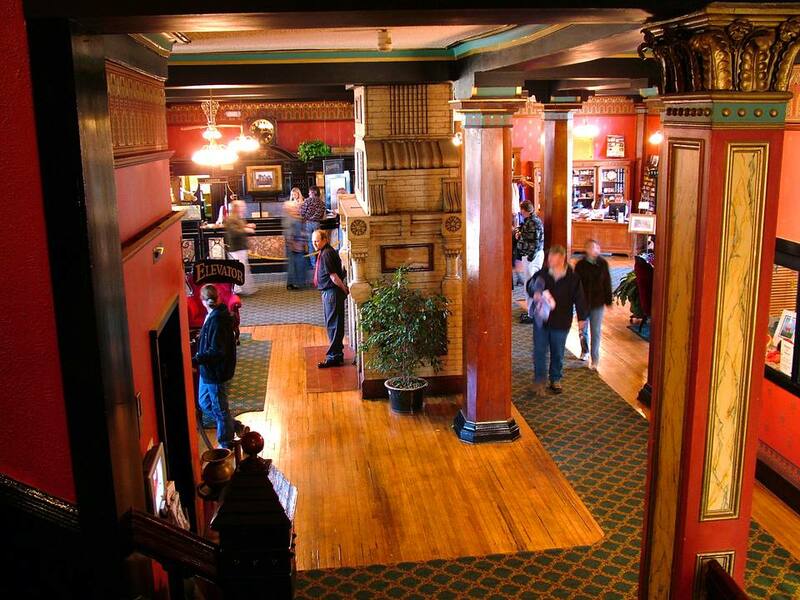 The Crescent is a beautiful, historic hotel that was built in 1886. The hotel has an odd history with lots of deaths surrounding it, and some say ghosts haunt the halls to tell their tales. Room 218 is the most haunted of all. Livingston Junction Caboose Lodges are actual train cabooses that have been converted to small but cute rooms. Each caboose has its own private driveway, an outdoor hot tub and deck, a grill and a hammock. These are also located in Eureka Springs. Inn at the Mill is exactly what it sounds like: an inn in a mill. It's located in Springdale. The inn is in the 1835 Johnson Mill, listed on the National Register of Historic Places. It has eight specialty suites in the mill and a nice restaurant. StoneWind is located in Chester (near Lake Fort Smith), with views of the Boston Mountains and the Ozark National Forest. The yurts are large circular rooms, dressed in modern conveniences. The property is in the middle of nature and has meditation trails and stone gardens. These bungalows in Eureka Springs are designed to be cute couples getaway cottages. They are located in a renovated, vintage, 1930s Art Deco Style service station. Arkansas has many lakes, rivers and waterways to explore. One of the best ways to experience the lake life is on a houseboat. Try renting one at the Bull Shoals Lake Dock, Anchors Away on Lake DeGray, or Almost Home on Lake Ouachita. Arkansas has two opportunities to stay at a historic schoolhouse. The first is the 1926 Cottonwood Schoolhouse in Omaha (in north Arkansas, near Branson, Mo.) which has two rooms and a kitchen. The second is the Schoolhouse Lodge in Bayou Meto (near Stuttgart). The Schoolhouse Lodge has six bedrooms with private bathrooms, a full kitchen, great room, boot room and spacious deck. Heifer Ranch has the ability to host a learning ranch retreat, but it won't be like a vacation. They cater to business groups and will give your team a unique experience learning about the ranch through some hands-on activities and lessons.